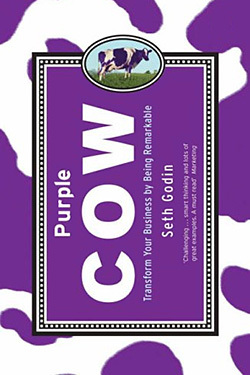 We continue our examination of the business book Purple Cow with an interview of author Seth Godin. What companies are using a purple cow strategy now, and how is Seth trying to change book publishing? What was the impetus for you to write Purple Cow? Years ago, I was lucky enough to become friends with Lionel Poilane, the greatest boulanger who ever lived. His bakery often had a line out the door, and people would fly from Japan (dozens a day) just to buy a bunch a bread and fly home with it. Lionel was smart and generous and incredibly honest in his fidelity to his dream. Two weeks before I was scheduled to have lunch with him in Paris, he and his wife died in a helicopter crash. His energy and vision left a void, not just for me, but for thousands. I decided that one way I could honor his memory was writing a book and then dedicating it to him. Why do you think the book was so successful and resonated with the business world in the way that it did? 1. The nature of business books was changing. Purple Cow isn’t a chore to read. It isn’t long, it’s filled with stories and it works. And 2. The world changed. Advertising was dying, fast, and there was pain throughout the land about what to do about it. It helps to have a useful, fun book that happens to be correct in its prescription, that’s easy to spread and comes in a milk carton, all at the right moment! With all the changes to the business world–the rise of social networks, crowdsourcing, etc.–would you change the idea of a Purple Cow in any way? Not a bit. That’s why I haven’t re-written it. The basic concept is simple and true: marketing is now about the product and the service, not the advertising. Remarkable ideas spread, and ideas that spread, win. None of that has changed due to Facebook. Have any companies emerged since the book’s release that are good examples of using a Purple Cow strategy? Every time we turn around, there’s another example. Zappos, for example, is not a customer service story, it’s a remarkability story. People talked about the customer service, causing a shoe store (a shoe store!) to end up being worth a billion dollars. Tony (Hsieh) understood that he had to create something remarkable if he wanted to grow. The publishing process is changing–and fast. Most major publishers think of their customers as bookstores, and as we’ve seen with the Borders filing, that’s not a great idea. At the same time, most major publishers make it DIFFICULT to spread their ideas. It’s almost as if the friction that paper causes is seen as a good thing. With the Domino Project, I’m trying to change both. Can we write for readers, make it easy for readers to share, organize readers to chime in, and give them the tools they need to change their organizations? That’s the mission. 1. Does this change the way I think? Will it make me act differently tomorrow? And 2. Do I desperately want to share this? The Tom Peters Seminar. Tom has created so much of value, and I have trouble picking. But it’s either this or the Wow book. See You at the Top. Zig Ziglar’s opus, still the most focused and personal motivational book ever. 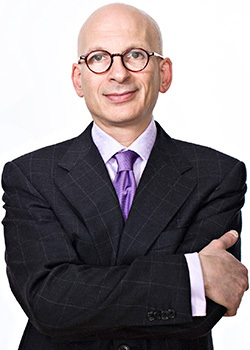 Seth Godin is the author of Purple Cow: Transform Your Business by Being Remarkable, published by Portfolio. Read more about Purple Cow or our Leadership Hall of Fame.